World Thinking Day is February 22! 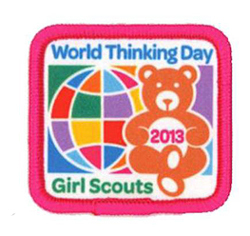 According to the GSUSA Website, World Thinking Day was created in 1926 as day for Girl Scouts and Girl Guides around the world to think of each other and be thankful for their “sister” Girl Scouts. This year, Girl Scouts will be focusing on thinking of the Girl Guides in Jordan, Malawi, Pakistan, Republic of Ireland, and Venezuela. What are you doing to celebrate World Thinking Day? Connect with us via Facebook, Twitter, or LinkedIn and let us know! Posted on February 20, 2013 at 11:19 AM in news, patches	| RSS feed You can	trackback	from your own site.